World Showcase is a smorgasbord of wonderful things to eat and drink. So much so, that it is very easy to fill-up in a single stop, and regret it the rest of the way around the promenade. Today’s entrée from China, however, will give you enough energy to keep moving on, but still leave room for a dessert, or two or three, later on down the way. There are a variety of options at the Lotus Blossom Cafe, and many of these are very satisfying, sometimes too much so. Then there is the Sesame Chicken Salad. A large bowl filled with mixed greens and topped with five or six pieces of the restaurant’s sesame chicken. The dressing, a sesame vinaigrette, is served on the side instead of tossed in with the salad to allow each guest to use a little or as much as they wish. The greens are very fresh and crisp, and I appreciate the diversity of the greens, rather than the nondescript sensations associated with a single type of lettuce, say iceberg. The chicken pieces are white meat, battered, fried, and drizzled with a sweet sauce and sesame seeds. The chicken is a generous portion size for the salad, and tastes very good, though you have probably had chicken that is just as good at a restaurant not in Walt Disney World. The sesame vinaigrette adds some unique tang to the salad, while lubricating the leaves, making them easier to swallow. My one word of caution to those picking up this salad, which I highly recommend, the Sesame Chicken Salad does contain a substantial serving of edamame. I, myself, am not a fan of this particular vegetable and was a little surprised that such a prominent ingredient was not included in the menu’s description of the dish. If you love edamame, this is even more of a reason to pick up this salad. If you are like me and could do without the green soybeans, fear not, the mostly collect at the bottom of the bowl and are easy to pick out. Their inclusion is not a reason to miss out on this light, but satisfying salad. 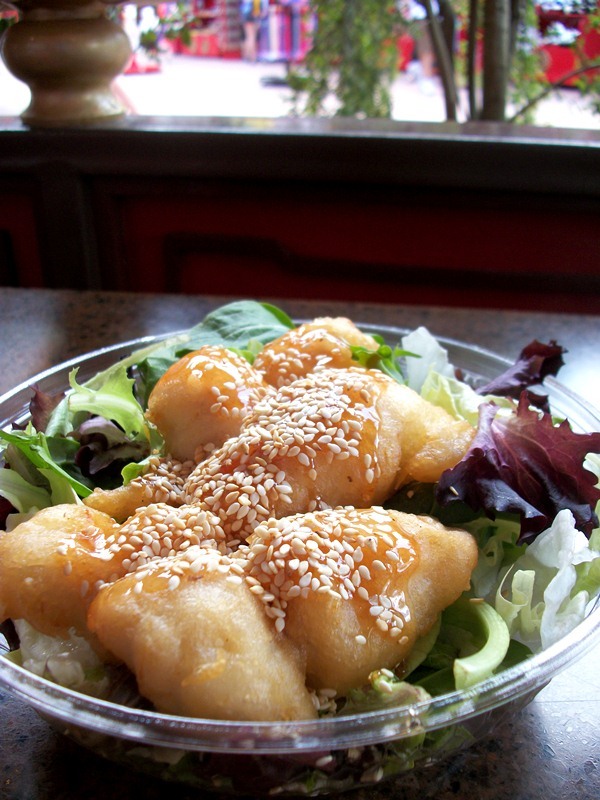 Overall, the Sesame Chicken Salad is a dish well worth utilizing as a lunch option. Moving clockwise around World Showcase, China is only the third stop in, the perfect spot for a lunch break. This salad will give you enough in the way of protein to keep moving along, but not enough to stop you from enjoying treat stops like Germany or France.